Air Chief Marshal Hugh Dowding ranks undoubtedly as one of the best remembered and most influential commanders in the 90 years of RAF history. Through his pivotal contribution in the development of the radar-based fighter defence system, Dowding may be considered by to be the father of modern aerial warfare. Indeed, the fundamental principles on which he devised his fighter system – that of radiolocation, visual overview of tactical situation, central command over available resources, efficient communications and rapid response, as still as valid today as they were at the time of the Battle of Britain. Dowding’s achievements appear even more remarkable if one considers that he envisioned his system entirely without the benefit of hindsight. His career roughly coincided with the first quarter of a century of the service (first RFC and then the RAF), when the technology and concepts surrounding aviation advanced immensely and rapidly. By the end of that period and just prior to his retirement, the courage and effectiveness of his Fighter Command would prove legendary during the Battle of Britain Battle, thwarting Adolf Hitler’s invasion plans despite being outnumbered by the opposing Luftwaffe forces. To better understand the future shock which Dowding and his contemporaries had to cope with during their lifetime it may be useful to have a look at the very beginning of his aviation career. Like many of the first RAF officers, his service began with the Royal Artillery. He obtained his pilot’s licence in December 1913, as member no. 711 of the Royal Aero Club, subsequently joining the RFC. Here is the exempt of Dowding’s personal notes explaining the background of his decision and his training. It makes an interesting comparison with the training of a fighter pilot in 1940. 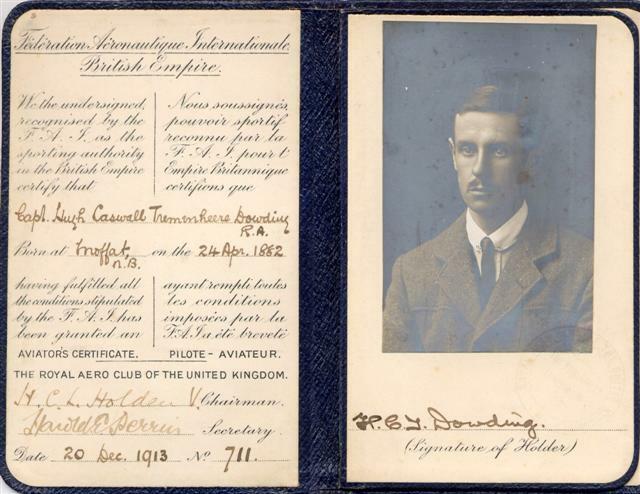 Dowding’s Aviator’s Certificate was issued on 20 December 1913. (…) This other subject was the Air, which was sedulously avoided in almost all our exercises. We used to work in syndicates, one student being in command and the rest representing his staff officers. Every one had his turn as Commander, and I, being one of the youngest and most junior students, was not appointed as Commander for over a year. When the great day came I found that I actually had six aeroplanes in imaginary command. Before contact was made with the enemy there was one question of outstanding importance to be settled, viz: were the enemy in possession of Grantham or were they not? So I decided to send all six of my aeroplanes to find out. My decision was being discussed by one of the most senior of the instructors, a Lieutenant Colonel. He said: ?How would your aeroplanes find their way to Grantham??. I replied ?They could fly up the railway line?. ?Oh, they couldn?t do that?, he said. ?Why not sir?? I asked. ?They would run in to one another? was the reply. I thought that perhaps it might be a good thing if the Army had some Staff Officers who knew something about flying and that I would like to be one of them; so I decided to learn to fly, as being the best, in fact the only way of finding out. At that time any officer chosen for the Royal Flying Corps could learn to fly with a civilian firm at his own expense, the Government refunding the cost, up to ?75, when he had got his ?ticket?. 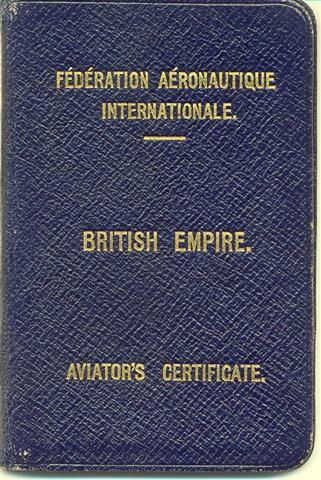 A civilian ticket was an essential prerequisite for entry to the Central Flying School at Upavaon. Being at the Staff College, I was a readily acceptable candidate for the R.F.C. At that time Vickers had a training school at Brooklands, and I made a covenant with them that I would pay them after I got my ticket, so I didn?t have to put up the ?75. In those days one only flew in the calm of the early morning before the sun had generated the thermal currents which gave rise to ?bumps?. My Naval Uncle very kindly lent me his car, and I used to start off in the dark from Camberley and get back again in time for the first lecture at 10 a.m. The chief instructor was a man named Barnwell, a first class pilot but not a good getter-up in the morning; so most of my instruction was given me by one of their ordinary mechanics ? a splendid fellow called Knight. The last day of my stay in Camberley I was ready for my flying test, but there was a final passing-out inspection on this last day, so I arranged with Barnwell that a machine should be ready at crack of dawn and that the Royal Aero Club official who acted as judge should be on the spot. But when I arrived the next morning there was no Barnwell, no machine and no judge. However, I found my friend Knight and he knew where the judge lived in Weybridge, so we got into the car, drove to Weybridge and fetched the judge with a greatcoat over his pyjamas. The three of us then opened the shed, wheeled out the machine and started it up. I then flew the prescribed number of figure-of-eights and landed within 50 feet of a mark on the ground, drove the judge back to bed and went into the ?Blue Bird? restaurant to pay my bill. He said “Why, have you changed your mind”? In due course I received my ticket entitling me to fly and carry passengers. I had been exactly one hour and 40 minutes in the air altogether ? passenger, dual and solo. The author thanks David Whiting for providing source material for this article.